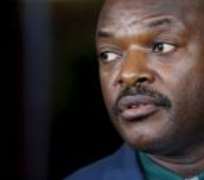 Burundi’s President Pierre Nkurunziza said on Wednesday that Burundians would fight against any peacekeepers sent into the country by the African Union, in his first public response to the AU’s plan to deal with an escalating political crisis. The African Union said this month it was ready to send 5,000 peacekeepers to protect civilians caught up in months of violence, invoking for the first time powers to intervene in a member state against its will. “Everyone has to respect Burundi borders,” Nkurunziza said in comments broadcast on state radio. “In case they violate those principles, they will have attacked the country and every Burundian will stand up and fight against them … The country will have been attacked and it will respond,” he said. Other government officials have already said any peacekeepers arriving without Burundi’s permission would violate its sovereignty. Nkurunziza also reiterated the government’s position that any opposition members who had taken part in a failed coup in May should be barred from participating in peace talks, which kicked off this week in Kampala, Uganda. The talks, brokered by the East African Community regional bloc, were expected to reconvene in Tanzania next month, but it remains unclear if Burundi’s government will participate if they do not agree on which individuals represent the opposition. More than 400 people have been killed and 220,000 have fled to neighbouring countries since the crisis erupted in April, triggered by Nkurunziza’s bid for a third term. Opposition groups took to the streets saying he was violating constitutional term limits. But he pointed to a court order allowing his campaign and was re-elected in a disputed July vote. Continued clashes and targeted assassinations in the central African nation have unsettled a region where memories of the 1994 genocide in neighbouring Rwanda are still raw. In his comments on Wednesday, Nkurunziza also appeared to praise Rwandan President Paul Kagame, who Burundi has accused of supporting rebel groups’ efforts to recruit Burundian refugees and of interfering in Burundi’s affairs. Kagame denies this. “I want to inform Rwandans that the relations with Rwanda will always be good as long I will be the president of Burundi,” Nkurunziza said.